Our pies will normally be delivered to you within 4 working days. Can you deliver pies any day of the week? We send our pies via an overnight courier, therefore, we are unable to deliver on Saturdays, Sundays or Mondays. 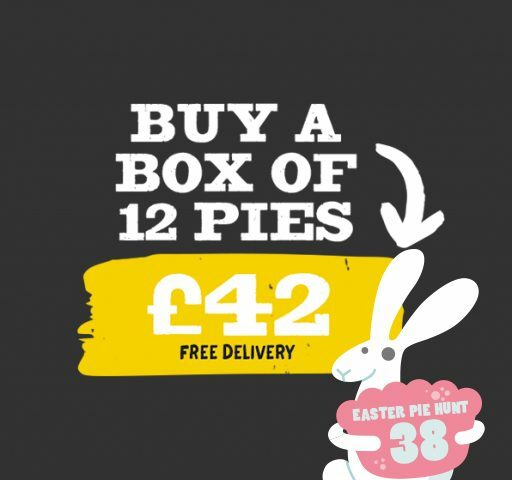 On a box of 12 pies, delivery is free of charge. On a box of 6 pies, there is a £5 postage charge. You can cook the classic pies in just 25 mins at 180°C / 160°C fan / 350°F gas mark 4 or the lighter pies for 20 minutes. Your pies will arrive in a temperature controlled box. They will need to be placed in the fridge on arrival before the end of the day. Your pies will arrive with a 7-10 day shelf life and can be frozen for up to six months. Are your pies 100% gluten free & coeliac approved? Yes – our gluten free Ranger, Moo and Heidi pies have all been certified as gluten free by Coeliac UK. Our gluten free pies are made in a small gluten free specific kitchen in Bristol, where no gluten is present. We swab test this environment on a daily basis, to ensure there is no cross-contamination and do a deep clean before production, to ensure we maintain a gluten free environment. Our gluten free pies are transported in separate containers and cooked using separate baking trays. There is gluten present in our restaurant kitchens, but we do our utmost to keep the gluten free pies separate. Can I order a mixed box of classic and gluten free pies? No – we have to follow strict regulations around gluten contamination and so cannot send gluten free and classic pies out together.